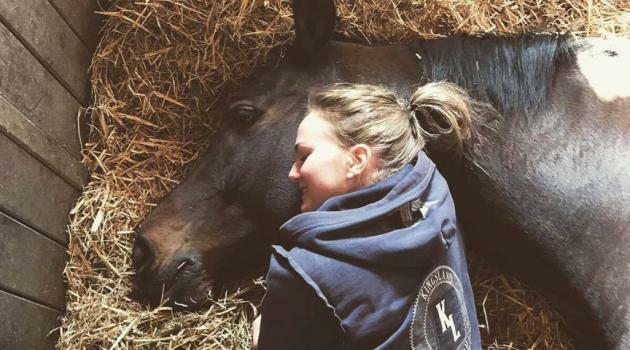 To a rider, a horse is not a ‘pet’ and not a friend. Your horse is a best friend, a listener, a partner, a team mate. Horses do not care about how many times you may come off, how covered in dirt you are, and at the end of the day: It doesn’t matter what colour ribbon you got. Because it’s your horse who will be there for you, to love you, and cherish every moment with you, to talk to you, and to listen to you. Please keep tagging us with #kingslandmoments on Instagram and sending us your pictures on Facebook. We treasure each and every one of them! Here are a small selection of the tagged pictures. -Be sure to follow us on Facebook for more, maybe your picture will be amongst the highlighted ones? The Elvira is in our own opinion, the most elegant, technical and fitted show jacket on the market for any female rider. This may be a bold statement, but from the looks of it, the riders that have tried it will very much agree! Elvira Master Collection jacket is for every rider on any level, whether it is for dressage or show jumping. With its four way stretch material in soft shell fabric, it is both water resistant and quick dry. The inside has a mesh lining, which prevents odour from sticking to the garment and good moisture control. It also allows for great ventilation while riding. The woven, water resistant quality, makes the fabric breathable but also lets drops of water peel of the garment. And at the same time, if you wash it on 30 °c the fabric will not wrinkle and is very easy to maintain. Another detail that makes the Elvira so elegant is the four front buttons. The collar has Alcantara with a metal piping. Both of these details give the jacket the “little extra”! The size ranges from European 32-44 and comes in the colours black and navy. Fun Fact: What is Alcantara? Alcantara is a covering microfibre material. It is primarily used in the design, fashion, accessories, consumer electronics, automotive and marine industries. Alcantara is composed of about 68%polyester and 32%polyurethane, giving increased durability and stain resistance. The appearance and tactile feel of the material is similar to that of suede. In the world of high fashion, Louis Vuitton uses Alcantara linings in many of its bags. Most famously, in the collaboration with Takashi Murakami under the creative direction of fashion designer Marc Jacobs, wherein the white Multicolor Monogram bags all have a bright fuchsia Alcantara lining. To shop our Elvira show jacket online, click here. Our design team are constantly developing new designs and products and are always trying to be innovative in the way Kingsland thinks about the appearance for our equestrian sport and lifestyle. You may have noticed our new line of show jackets; the Master Collection? These incredible jackets are, in our opinion, the most delicate, well manufactured, stylish, technical and yet easy to maintain, show jackets. And they will meet each riders different wishes when it comes to fitting, durability and looks. Over the course of the next weeks we will take a further dive into the details of the different jackets. In addition we will also provide you with our riders and ambassadors honest reviews. We are hoping this may help you in choosing the right show jacket for yourself to match your needs. Also we will provide a list over the different shops around the world where the jackets can be purchased.